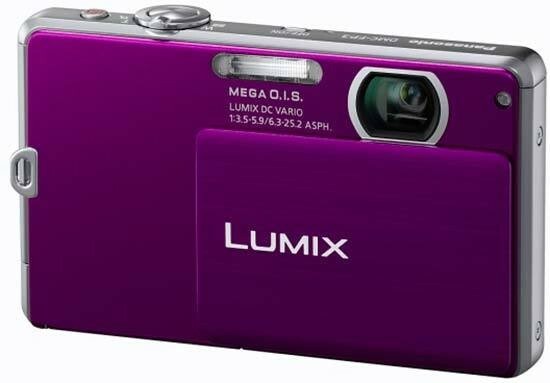 The Panasonic Lumix DMC-FP3 is an ultra-slim pocket camera featuring a 4x optical zoom lens with a folded optics design. The 14 megapixel FP3 has a sliding cover that protects the lens and also serves as the power switch, while the 3 inch touch-screen LCD on the rear works in conjunction with the traditional navigation pad buttons. The Panasonic Lumix DMC-FP3 also offersan Intelligent Auto (iA) mode for beginners, Sonic Speed auto-focus, MEGA O.I.S. anti-shake system, HD video recording at 1280x720p at 30 fps, and compatibility with Panasonic's new SDXC cards. Available in no less than 12 different colours, the Panasonic FP3 retails for around £179 / $230. An attractively brushed metal slide-open-and-shoot lens cover plus slender dimensions ensure that the 14.1 effective megapixel Lumix DMC-FP3 from Panasonic not so subtly references Sony Cyber-shot snapshots with regard to its style and operation. Like that range it also features cleverly folded optics, here a 4x optical zoom equivalent to 35-140mm on a 35mm film camera, though the main selling/talking point is a 3-inch, 230,400-dot resolution touch screen. This somewhat distracts from the inevitable debate as to whether we actually need 14 megapixels from a snapshot model and whether sticking with fewer pixels would actually yield better results from the 14.5MP 1/2.33-inch CCD here. Plus for those who don't wholeheartedly love touch screens Panasonic has thoughtfully featured a range of operational buttons and controls in tandem with the LCD. This could be viewed as delivering a best of both worlds solution. There's a simultaneously launched sister model in the FP1 that instead offers a lower 12.1 megapixel resolution and smaller 2.7-inch non-touch LCD. To ensnare the younger audience the FP3 itself is available in a now predictable assortment of colours - five in total. While the broader than average if ultimately conservative focal range offered by the FP3 should serve point-and-shoot photographers well as a general-purpose tool, there are inevitably better ultra compact options out there for those preferring a wider-angle lens for landscapes and panoramas. There's additionally the option to boost the zoom power to an 8.4x (294mm) equivalent courtesy of what Panasonic terms its Extra Optical Zoom function. Since this uses only the central portion of the CCD - effectively performing a crop - there's a resultant drop in resolution down to three megapixels. Users do however get the other current 'must have' in that the FP3 can record 16:9 widescreen ratio high definition video clips in motion JPEG format, here at the lower 1280x720p resolution and 30fps frame rate rather than a full HD 1920x1080p, but still better than a standard definition option. That said there is the ability if so desired to indeed record at the lower 640x480 pixels (VGA) or 848x480 (WVGA). All this comes for a fairly reasonable suggested price of £179 in the UK, especially given the build quality and classy looks of our all-black test sample. Sitting comfortably in the palm of your hand and not a great deal wider than a business card (though obviously deeper!) the camera doesn't feel cheap by any means, and is reassuringly solid despite its svelte dimensions and light weight (at 145g including battery and card), thanks to its metal parts augmenting the well-disguised plastic. Processing is handled via Panasonic's on-board Venus Engine IV (rather than, curiously, the otherwise available V featuring in the company's FX models) and this helps make the camera as responsive as you'd want it to be, particularly with regard to each exploratory screen press and prod. Its manufacturer claims its inclusion has enabled a shutter as brief as 0.006 second, the ability to lock 'sonic speed' AF on a subject in a blink of an eye (officially 0.33 second) with an impressively brief start up time of a fraction under a second at 0.96. Other main features of note on the FP3 are available light sensitivity to a maximum ISO6400 equivalent (via the resolution reducing High Sensitivity scene mode, otherwise a maximum ISO1600 manually selectable), and a battery life courtesy of its rechargeable lithium ion pack claimed to last up to 300 shots per charge, according to CIPA testing. As expected, the camera majors on ease of use with Intelligent Auto - which has its own dedicated button on the top plate - meaning that all any user has to do is point the camera at a scene or subject and the FP3, will, in theory adjust settings accordingly to achieve optimum results, with not only face detection technology incorporated but a choice of six settings for the camera to cross reference. These are macro, portrait, scenery, night portrait, night scenery and the new addition of sunset. The belt and braces of Mega OIS (optical image stabilization) and Intelligent ISO (optimizing shutter speed and boosting ISO) further combine to help reduce the effects of camera shake when shooting in available light without flash. Unsurprisingly the lower or hazier the light the greater the proportion of soft-ish images and especially when there's not really anything in the way of a grip provided on this model to ensure a firm hold, just a small square of plastic nodules top right of the back plate that provide some purchase for the thumb. Holding the camera level in both hands provides the most practical solution, though the user runs the danger of a fingertip from their left hand then straying into shot as the lens is located over to the far side of the faceplate. The touch screen itself features four main virtual buttons, summoned up with a press of the 'mode' button at the back. With the camera obviously aimed at the non photographer, options are simplified as being for the taking of a 'normal' picture, video recording, selecting from the 25 available scene modes, plus a further 'My Scene' setting. In effect this is a custom mode that retains a user specified scene for speedy access in the heat of the moment. For stills shooting there's the ability to bias the AF toward a certain part of the frame simply by tapping on that portion of the screen, or this feature can be disabled if the little icon that pops up gets too distracting. In playback mode, drawing a finger across the screen lets you 'flick' from one image to the next as if turning the pages of a photo album, literally a nice touch if an inessential one. Further ease of use is provided via a dedicated Q.Menu button bottom right of the camera backplate that will already be familiar to Panasonic Lumix compact owners. This 'quick menu' function calls up a tool bar on screen that with a finger prod allows the selection and alteration of key shooting functions without otherwise having to delve into the on-screen menus to change the same. The icons are however bunched so closely together that it's easy on occasion to select a setting adjacent to the one you actually wanted. Like the latest raft of Canon compacts, Panasonic is offering compatibility with the newer very high capacity SDXC media cards alongside the more familiar SD and SDHC variety. These optional extras supplement the 40MB integral memory that allows users to be all too briefly up and shooting out of the box. A card slot is provided alongside the battery at the camera's base, screw thread for a tripod located dead centre, so obviously if you need to swap cards whilst using the camera on a tripod, the whole thing has to be unscrewed. Overall though the FP3 presents a coolly sophisticated front, an impression which commences with that non-more-minimalist faceplate, Lumix logo-ed lens cover hiding lens itself, self-timer/AF assist lamp plus narrow lozenge-shaped flash. The narrow metallic top plate, a mere 18.6mm in depth, features a tiny dot housing the built-in microphone, next to the equally small on/off button with a ridged top so your forefinger can actually find it. To the right of these, when viewing the camera from the rear, we find the largest button on the camera - thankfully the shutter release button - which is in turn encircled by a lever for operating the zoom. To the right of this, as on last year's FP8 model, we find the dedicated button for iA, intelligent auto mode, which for some reason features here rather than on the screen itself as a short cut. Switch the camera on and it indeed powers up more or less instantaneously - which is exactly what you want when quickly retrieving it from a coat or jacket pocket when that photo opportunity has presented itself. The zoom action, whilst it doesn't exactly glide like some of its competitors, is nevertheless smooth, travelling from maximum wideangle to telephoto in around three seconds. Press the shutter release button halfway and the camera determines focus and exposure in under a second too, focus point highlighted in green with a bleep of affirmation that the user is free to go on and take the shot. Do so and a maximum resolution JPEG is written to memory in three seconds, screen briefly going blank before displaying the captured image. With no Quick Zoom button otherwise provided here as on previous models, this is pretty much exactly the performance you'd expect from this class of camera. Unsurprisingly, just over two thirds of the camera's back plate is swallowed up by the adequate visibility 3-inch 230k-dot resolution LCD on offer for shot composition and review, with the ability to adjust its mode for high angle shooting over the heads of a crowd via the Quick menu button and resulting on screen toolbar as previously mentioned. We say adequate, because like its predecessor in the FP8 while the screen is relatively clear in terms of visibility when shooting outdoors, when panning around rooms indoors there is slight ghosting and image lag visible; not unexpected at the entry level end of the market. Unusually for a touch screen model however, and again as mentioned in our intro, Panasonic has also incorporated physical controls into the FP3's operation, with a vertically stacked row of five buttons, starting top right of the screen at the camera back with a familiar playback button for reviewing captured images. This is useful as not only does the control fall readily to hand, but with a half press of the shutter release button users can conveniently jump back to capture mode in an instant if a photo opportunity suddenly presents itself. And not only can the user, in this mode, tap the left and right indicators provided to scroll through images; they can also, as previously indicated, trace a finger across the screen to do the same. Go on to press the self-explanatory mode button just below playback and, whilst still in review mode, users are prevented with an array of virtual buttons on screen. These present the ability to enjoy, with a further tap, the default setting of 'normal' playback, review the images as a slideshow in camera, or play back images by their category only - for example all images taken on the night time scene mode setting, or all the video clips together, which is a tidy idea. In addition the fourth virtual button allows the playback of favourite images only, whilst a press of the fifth presents an on-screen calendar displaying an image against the day of the week on which it was taken. As you tab around the calendar, again poking at virtual direction buttons, images relevant to adjacent dates pop up; clever, but again a less than essential feature for many. The last, and sixth virtual button on the screen provides the ability to play images back as a series of thumbnails and thus scroll through swathes of images in a matter of seconds to pinpoint the one you want to view, a subsequent double press bringing it up 'full size' on screen. Return to image capture mode and press the mode button again and users are offered the choice of taking a 'normal' fully auto picture, selecting one of the pre-optimised 25 scene modes for just about any given subject, or opting for My Scene Mode, whereby the camera is always set to one particular subject of the user's choosing, all of which are again reproduced in slightly superfluous fashion. The last shooting mode option is for video capture, while, as on last year's Photography Blog reviewed FP8 model from Panasonic, a press of the dedicated iA button to the right of the shutter release on the camera's top plate lets the user quickly flip between fully auto capture and whatever alternative mode was last in use - a straightforward process. The next (third) button down of the FP3's non-virtual back plate controls is marked display. A press of this removes the on-screen icons, including those indicating battery life, megapixel mode and number of shots remaining, to present a clear view of your scene or subject. A subsequent press brings up a nine zone compositional grid for those practicing the rule of thirds. The fourth button down is the one marked with a self-explanatory 'menu'. A press of this brings up on screen a choice of two folders - one a four screen shooting menu, its options presented on screen-wide bars stacked three at a time so presentation is both simple and they're easy to press, the other a set up menu presented across six subsequent screens. Neither offers much in the way of manual control, unless you count being able to adjust white balance, ISO and exposure compensation from +/- 2EV, and turn on or off the digital zoom. But, again, this makes for straightforward, user friendly operation of what, at the end of the day is ultimately 'just' a point and shoot camera. Below the menu the button things get slightly more interesting with the last button on the camera back for the aforementioned quick menu. The toolbar this presents, with icons running across the top of the screen and drop down options appearing when each is pressed, firstly allows different image stabilizer modes to be selected with - if you subsequently press the 'display' button - an on-screen graphical demo provided of what the different settings do. The next option is the ability to switch to burst shooting - with either 1.5 frames per second or 4.6fps offered depending on the level of quality the user is looking to achieve - followed by the ability to adjust AF from one point to nine points or activate face detection. Adjacent to these are options for adjusting white balance, ISO (ISO80-1600), resolution (from maximum 14MP down to 0.3MP, or opt for a 10.5MP widescreen ratio crop), choosing an LCD operational mode, and when in 'normal' auto mode further adjusting exposure compensation, choosing macro, activating a self timer and adjusting flash options. At each stage in the proceedings an 'exit' button is provided to take you quickly and easily out of whatever selection you're in. Incidentally when in playback, this Quick Menu button doubles up as a delete button, which is useful and saves wading into menus to achieve the same. Whilst that's about it for operational controls at back of the FP3, the left hand side of the camera is devoid of any features at all, whilst the right incorporates a thumb-opened flap protecting separate ports for USB out, AV out and mains power in. The base of the camera we've already described. Whilst it takes a little while to familiarise yourself with how the FP3's array of physical buttons and virtual controls work in tandem with one another, this quickly becomes second nature and operation can be achieved without recourse to the manual, the full version of which is only miserly provided on CD with otherwise a quick look pamphlet included in the box.